It is with great pleasure that the Fondation Jean-Pierre Perreault (FJPP) has invited Quebec choreographer and teacher Manon Hotte to present the creative process behind the archival installation Blanc Mémoire. Ms. Hotte, who is based in Geneva, co-developed the installation with Swiss photographer and stage director Dorothée Thébert. The performative presentation will take place at 840 Cherrier, Montreal, K-2210, on Wednesday, September 19, at 5 p.m.
Blanc Mémoire emerged from both artists’ questionings regarding their respective practices and the role that memory and traces play in artistic creation. Their starting point was the development of the archival fonds Création, semis et palabres _ Fonds Manon Hotte, which was finalized in 2017. This fonds is unique in that it is centred on both the conservation of works and creative processes. Manon Hotte and Dorothée Thébert were interested in getting the public involved in these processes, using performance venues as spaces for exchange and sharing. Their creative encounter resulted in Blanc Mémoire, an open-ended archival installation that elicits input from the public. As visitors interact with the work by observing, reading, experiencing and responding, they get a tangible sense of what goes into creating a dance work. The installation is in turn enriched by each interaction. To conclude her presentation, Ms. Hotte will invite the audience to engage in a moment of exploration so that they in turn can leave a trace, a personal account inspired by the work Blanc Mémoire. Manon Hotte has been involved in the professional dance world for over 40 years. She started out as a dancer for international troupes in Quebec, and in 1981, moved to Geneva, Switzerland, where she gradually made a place for herself in the world of contemporary dance and interdisciplinary creation. She became interested in working with young dancers and, in 1993, founded the Atelier Danse Manon Hotte (ADMH) and, in 1998, Cie Virevolte. The hallmark of her work is interdisciplinary performative creation, specifically with children and teenagers. 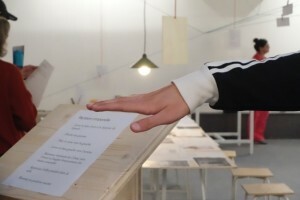 Since 2014, Manon Hotte has been collaborating with the association CAP NORD to complete the project Création, semis et palabres, which involves developing her dynamic and open-ended archival fonds, housed in Projet H107 in Geneva. She co-founded this contemporary dance space with two Genevan dancer-choreographers with a view to creating synergies among young and established artists, and the general public. It is entirely dedicated to the creation and artistic transmission of contemporary dance. Wednesday, September 19, 2018, at 5 p.m.
Info: info@fjpp.ca / Please RSVP! The FJPP is deeply grateful to the Dance Department of UQAM for its collaboration in hosting this event. The FJPP would also like to thank the Conseil des arts et des lettres du Québec, the Canada Council for the Arts, and the Conseil des arts de Montréal for supporting all of its projects.